Owls are nocturnal birds of prey found in most regions of Earth except Antarctica. Facts about some of the best know species or families of owls like the snowy owl, the barn owl, great horned owl and others. There are some endangered species of owls and the conservation efforts made to preserve them. Facts about Great Horned Owls, Barn Owls, Snowy Owls, Barred Owls and many others. Anatomy, Feeding, Habitat, Evolution, Predators and Reproduction. Owls are very interesting birds, and one that many other types of birds are afraid of. In fact, fake owls are often placed on top of buildings to keep pigeons and other types of birds from making nests there. The owl is said to be a symbol of wisdom and they make a unique sound at night that is distinctly identifiable. The owl is one of the species of birds that you do don’t see very often though, but only hear. This is due to the fact that the owl isn’t a bird that is out during the day. They are known to be very active at night only. There are two main categories of owls – barn owls and typical owls. 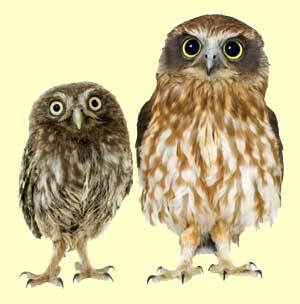 You will find quite a difference when it comes to the size of different species of owls out there. Some of them are only about 4 inches when fully mature with the largest ones being about 28 inches fully grown. They vary in color too depending on the region where they live. They blend in well with their surroundings which makes it hard to spot them unless you are avidly searching for them in a given environment. Owls are believed to be among the smartest of all birds. There are two main categories of owls, typical owls and barn owls. Owls are fascinating to observe due to their behaviors. They are almost always found living alone. They may form a pair though or a small flock in some locations but that is very unusual. In areas where their natural habitat continues to get smaller though it is becoming more common. The overall anatomy of the owl is quite interesting. They have large eyes, a rounded body, and small ears. They also have great vision and sense of smell. They can fly very quickly even though most of the time you see one it may be perched and not moving at all. Owls have a routine that starts their day and it is interesting to see. They are very meticulous when it comes to their appearance. They will spend their first few hours awake preening and stretching. The talons will be used to clean over the feathers. Then the beak is used to clean the talons. An owl won’t leave its roost without this activity taking place unless they are scared off by predators. They are extremely good at stalking their prey, patiently waiting for the right time to swoop down and get them. They can get prey that is in the water, on land, and in some circumstances even under ground. With their powerful talons they are able to pick up food and continue in flight. The food is transferred to their beaks where it is swallowed whole. The owl has to regurgitate pellets about 10 hours after eating with the bones, fur, and other remains that they weren’t able to properly digest. In many cultures the owl is a sacred animal and one that humans don’t bother very much. Yet there are plenty of locations out there where their natural habitat continues to be taken away for humans to use that area for something else. As a result it has reduced the overall population of many species drastically. This is why some species of owls are in jeopardy of becoming extinct. This is also why there are plenty of conservation efforts in place. The goal is to educate people about the needs of owls as well as their natural habitat. The hope is that by doing so people will do all they can to help protect these fascinating birds. While we do know quite a bit about owls, there is still plenty that we haven’t figured out yet. Part of the key to successfully protecting them also involves more research and data.